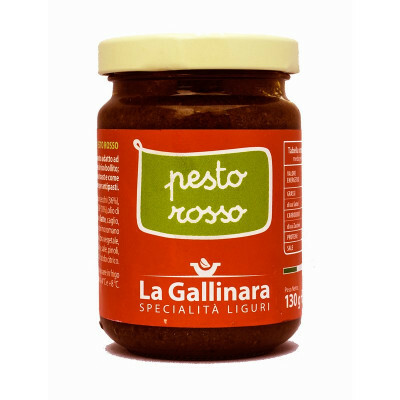 A ready to use seasoning for all types of pasta and boiled rice, as a spread on toast or as a garnish on starters. The version with tomato of the most traditional Genovese pesto. 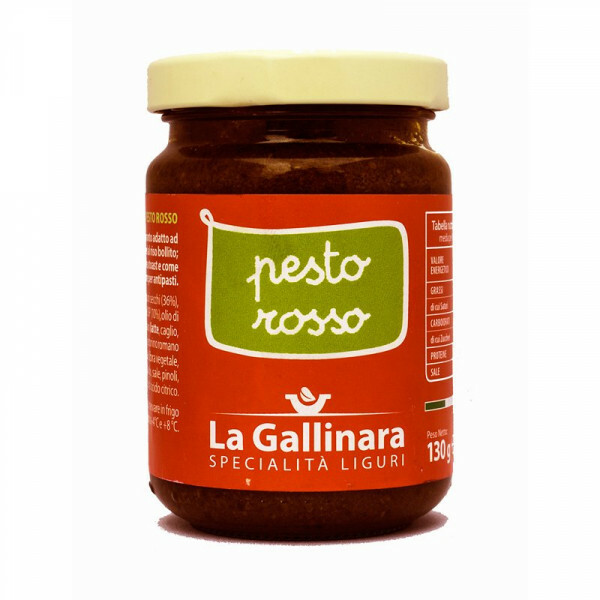 La Gallinara selects high quality tomatoes and DOP basil for this tasty red pesto, one of the indispensable condiments in the kitchen, to allow you to make delicious dishes even for last-minute guests or for those who have little time to devote to cooking. Dried tomatoes (36%), Genovese basil d.o.p. (10%) olive oil, Grana Padano (milk, rennet, lysozyme, salt ) Roman Pecorino (milk, rennet, salt) plant fiber, cashew nuts, garlic, salt, pine nuts, acidity regulator: citric acid. MILK, NUTS. No preservatives and colorants.